As college admissions grow increasingly competitive each year, all parties involved scramble to determine how best to produce positive outcomes. Students, families, and admissions officers all desire as much information as possible to make informed decisions throughout the admissions process. Though college applications are designed to glean plenty of insight into each individual applicant, they will never tell a candidate’s entire life story (nor should they). However, admissions officers tasked with building a dynamic and well-rounded student body must utilize any and all available information, sometimes including material not included in the application. Yep, colleges admissions officers are potentially looking you up on Google, Instagram, Twitter, Snapchat, LinkedIn and any other online platforms where you may have a presence. Surprised? Don’t be. The internet is thoroughly woven into the fabric of modern society, allowing immediate access to infinite information. Why wouldn’t admissions incorporate that access into their work? 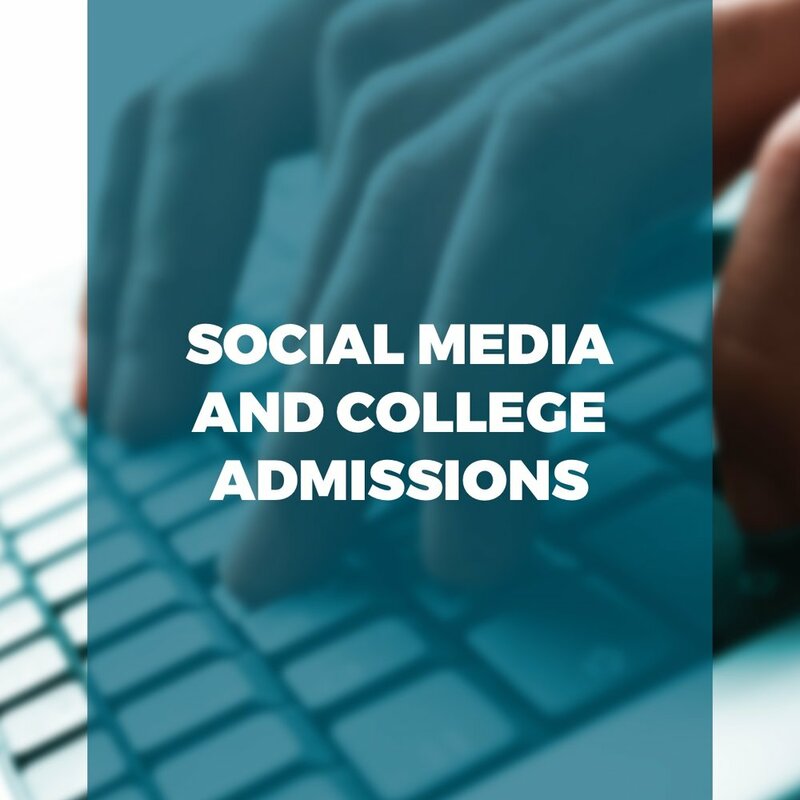 A quick search can yield potentially valuable information, so let’s explore ways in which you can ensure your social media presence helps instead of hurts your admissions candidacy. Before sending in any applications, review your internet presence. All of your online profiles collectively create your brand, or signature. You should use this branding to highlight positive traits, abilities, interests, accomplishments and more, essentially everything that makes you YOU. Depending on which social media platforms you use, consider how your messages and images communicate out to the world. Are there common themes reflective of your passions and interests? If not, think of ways to project a unified expression of your personality. These should be the same qualities and characteristics that you will want to emphasize in your college application. Are you a cerebral physics expert who likes to rock out on the guitar? How about a passionate community activist who loves the outdoors? Make sure these qualities pop throughout your online profiles to ensure an ideal reflection of your personality. Additionally, make sure your usernames aren’t immature or unprofessional. The email address and usernames from your earlier years may no longer be the most sophisticated for the image you want to project today. If anything on your profiles could potentially raise a warning flag, your best bet may be to just delete it. Why risk the chance when important decisions about your future are at stake? I’m sure by now many, if not most, of you have heard the report of Harvard rescinding admissions offers to at least ten accepted students over offensive memes in a private Facebook group. This example demonstrates how serious the consequences can be for negative online activity. You don’t want to waste opportunities that you’ve spent years working for because of easily avoidable conduct. That said, you should certainly review all of the privacy settings on your social media platforms, and check exactly where and how you are being broadcast. You may realize that your audience is much wider than anticipated, and modifying your settings can protect you from unwanted exposure. Social media can be an effective research and engagement tool throughout the college admissions process. Colleges often have plenty of social media pages and profiles where you can learn more about specific departments, programs, resources, clubs and more. Based on your college list, you should follow pages that genuinely appeal to you and feel free to like or retweet any posts that resonate with you. This is a simple approach you can take to begin establishing a connection with colleges, and you may learn more about whether or not a particular school is actually a good fit for you. Branching out your social media profiles develops a network that you can rely upon for guidance and feedback as you navigate college admissions. You may find yourself connecting with current students, alumni, professors or administrative staff, all of whom could provide invaluable insight that you might not discover otherwise. Their insight could also form the basis for your supplemental essays, which always read more thoughtfully when students conduct adequate research into a school. Ultimately, there is no way to predict how social media will influence your college admissions decisions. Like many elements of the admissions process, social media has a fluid role that may or may not impact your candidacy. The primary considerations remain the same (GPA, test scores, extracurriculars, essays, recommendations, etc. ), and you should focus on those first and foremost. However, do not neglect the potential of social media, which could yield benefits if harnessed properly. Think of it as another opportunity to showcase yourself in a positive and appropriate light. While it’s not guaranteed that an admissions officer will seek out your social media profiles, keep in mind the various ways in which you can use them to your advantage. It’s never too late to develop your voice and share your unique message with the world. Looking for expert help putting together your college applications? Contact your local Elite branch and ask about our College Application Workshops!